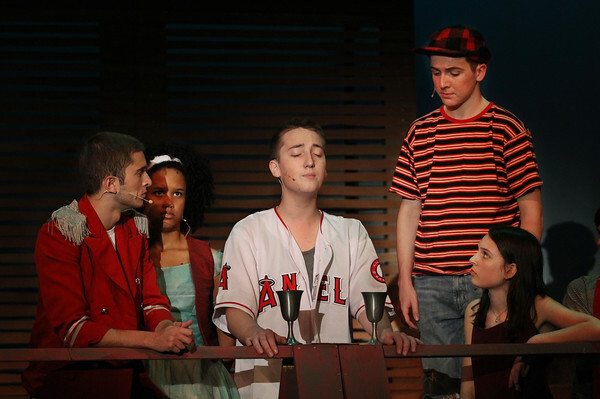 Junior Nick Endicott plays Jesus at the "Last Supper" with, from left, senior Logan Trupiano, who plays Judas, sophomore Nadia Robertson, junior Jack Reilly and sophomore Anna Catena, during a dress rehearsal Thursday for the musical "Godspell" at Rockport High School. The play opened Friday evening and will continue Saturday at 7 p.m. and Sunday at 2 p.m. in the school auditorium. Tickets are $10 for adults and $8 for students and seniors.